Mackenzie came to South Africa to escape the trauma of her past and build herself a bright new future: love is the last thing on her mind. But she’s finding it increasingly hard to ignore her feelings for the strong-minded Cole, who runs the game reserve for cheetahs just outside her town. Cole has made no secret of his feelings for her, but he realises that Mackenzie cannot be rushed so he is prepared to wait. However, neither could have predicted the terrifying events that are about to overtake them. When Cole saves Mackenzie from a vicious attack, it is only the beginning of an ever-spiralling maelstrom of violence. T.M. Clark treds where others may fear going: tackling topics such as the poaching of cheetahs in Africa, conservation, corruption, and violence in Tears of the Cheetah. Mackenzie is a strong and independent woman whose passion and integrity add grit and appeal to her character. A woman like Mackenzie needs a strong-willed counter-part and Cole certainly rises to the challenge. In addition, the countryside is as much a character as Mackenzie and Cole with Clark painting a vivid and entirely impartial view of Africa. 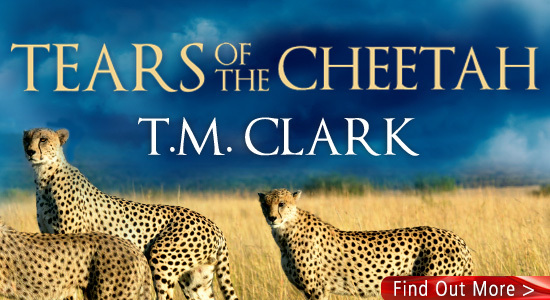 Clark’s voice shines brightly and with much conviction in Tears of the Cheetah. Her insider knowledge of Africa (having been born and raised there) is clear and articulate and the authenticity of her storytelling voice is resounding. Tears of the Cheetah is a read that captivates you from the opening words right through to the last leaving you in a state of shock (I had to close the book and just breathe several times) and awe at the intensity and vividness of the storytelling. A brilliant read and one of the best novels of 2015. Thank you so much for an absolutely fabulous review Jaimee!